Yes, it's amazing. I'm watching the tv broadcast version, and it's interesting to see how tentative Armstrong is in his movements. We're so jaded with Sci-fi flicks where everyone is zipping about with total abandon. This guy is standing on the moon! He'd better be careful. I agree Vito; it was a bit surreal. Some of the images looked like moving X-rays to me. By the way, I listened to the NASA webcast on my headphones while watching the televised version on another computer. Early on it was almost 8 seconds out of sync; later it was almost right. Very odd. I wonder if the craters Houston referred to as "the irregular-looking" "old-looking" "small bright crater" were named later. When Neil Armstrong says, "You can really throw things a long way up here," what did he throw? A rock? ain't enough, see Apollo 11 Image Library for more). 2. The handle of the scoop that he used to collect the contingency sample (that is, the first moonrock). 3. False. Debunked at snopes.com: Good Luck, Mr. Gorsky! Holy Moonwalk, CH, that's a lot of info! :) Thanks so much, and yes, I think it's safe to say all the craters around there were named. As for the joke, the guy who told me even had the wrong astronaut. And he's telling everyone it's true. One more question, and I hope it's not as ignorant as I feel asking it. It's been said that unless the moon was hit by a meteor in that very spot, the footprints should still be there. If that's the case, why hasn't a more recent photo been taken to shut down the claim that the whole thing was a hoax? Jim Scotti has provided a cropped version showing West Crater and the landing site. René and Jonathan Cantin have created a film of the Apollo 11 Final Approach ( 10 Mb, wmv ) that is a side-by-side composite of the landing film and LO 5076_h3, with a number of craters matched up in the two views. That wmv is a link. Have you watched it? No wonder everyone was on pins and needles during the descent. It took a long time, considering the limited fuel. 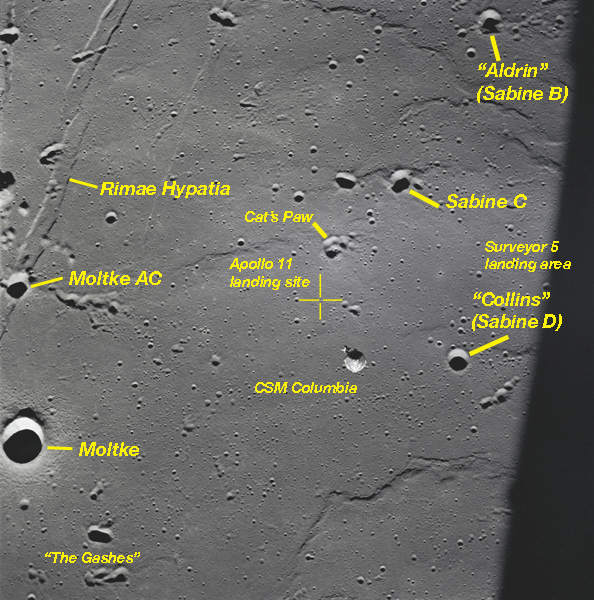 There is a satelite circling the moon right now that is mapping the surface, and they just recently sent posted pictures with the LEM base was still visible at the Tranquility Base. The camera is not good enough to resolve footprints, barely making out the LEM base. They may need a Canon 5D. They also have pictures at other sites, where the lunar rover is still sitting there after all these years, hubcaps and everything still on them. "Just left the Lunar sphere of influence". Damn you, Chris! I'm hooked! of the big moments are over... but I still want to hear how it ends. This is the longest I've ever had any webcast tuned in. ...the footprints should still be there. There is a satelite circling the moon right now that is mapping the surface, and they just recently sent posted pictures with the LEM base was still visible at the Tranquility Base. The camera is not good enough to resolve footprints, barely making out the LEM base. LRO actually has photographed the walking trails left behind on the lunar surface by Alan Shepard and Edgar Mitchell during their two Apollo 14 EVAs: NASA - LRO Sees Apollo Landing Sites -- that's about as good as it gets with regard to resolving footprints from lunar orbit! If that's the case, why hasn't a more recent photo been taken to shut down the claim that the whole thing was a hoax? Two reasons... first, if the overwhelming scientific and technical evidence and the vast historical record accumulated 40 years ago aren't enough to convince the lunar landing hoax believers, then what difference would an image from LRO make today? After all, LRO is a NASA project and therefore just another part of that massive conspiracy, right? 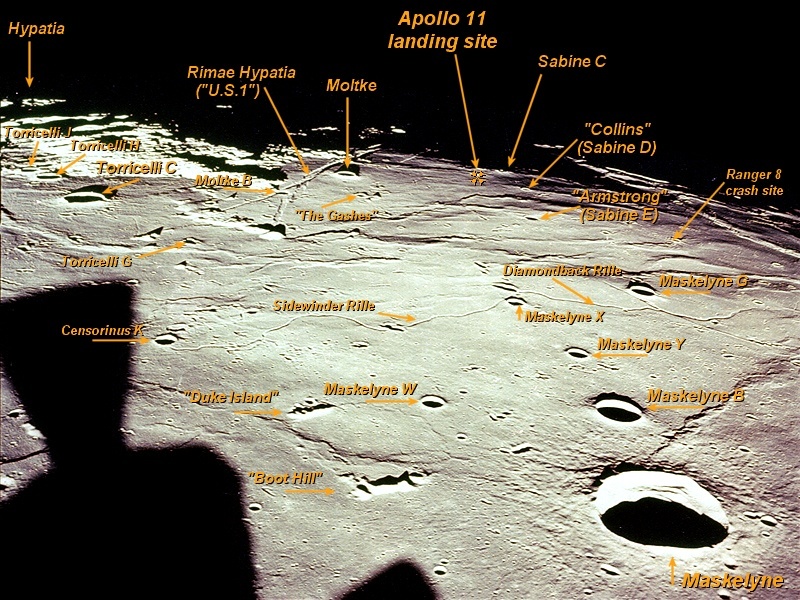 The other day I saw somebody's blog that pointed to the header data in one of the LRO images of the Apollo 11 landing site. The header data said "Photoshop," which was proof enough for the blogger to believe that the image was fake. Well, of course that image had been run through Photoshop, as that's a very common way to convert an image to .JPG format and re-size it for web delivery! Sheesh. Second, I'm not so sure that the lunar landing hoax claims need to be shut down. All of that nonsense has long since been thoroughly de-bunked, and the accomplishments of the Apollo program don't require any more validation. Conspiracy theorists are drawn to the Internet like June bugs to a porch light, but there's never any agreement or consistency among them -- just a lot of willful ignorance. In my opinion, the lunar landing hoax claims really do serve a worthwhile purpose: they're an opportunity to educate (to learn, for example, about the dynamic range of film and why stars aren't recorded on exposures set to f/16 at 1/500th, and about the specular illumination of back-lit objects on the highly reflective lunar surface). Ultimately these hoax theories present an excellent example of Occam's Razor in action... if you weigh all of the enormity, complexities and self-contradictions of the proposed hoax, it becomes far more believable and easier to accept that yes we really did go to the Moon. There's a lot of hoax de-bunking available online, but a couple of the best are Clavius Moon Base - debunking the moon hoax and The Moon Hoax Debate as well as http://en.wikipedia.org/wiki/Apollo_...iracy_theories -- leaving NASA with little else to do on this matter beyond showing off their new LRO images of Tranquility Base. To put your name in a line from my favorite movie, "You just keep thinkin', Chris--that's what you're good at." Believe it or not it makes sense to me now that you've spelled it out. And I mean *spelled* it out. Great stuff! I have learned so much in the last few days. After all, LRO is a NASA project and therefore just another part of that massive conspiracy, right? Right. Now don't I feel silly!